Being the oldest and most effective original telegram, watchtowers are the most important component of the defensive project on the Great Wall. They were built continually to pass military messages. In ancient times, if intruders approached, soldiers on the wall would create smoke in the daytime and light a fire at night to warn their troops. The history of watchtower construction is earlier than the building of the Great Wall itself. The Han Dynasty (206BC – 220AD) emphasized on the construction of watchtowers, in some sections, the successive towers even replaced the wall to form the defense system. As per the construction of the wall, they were built by using local materials according to the local conditions. In mountainous areas, they are built by laying pieces of stones and bricks. While in grassland and desert, they are of rammed-loam construction. The shapes differ and are square, rectangular or round. 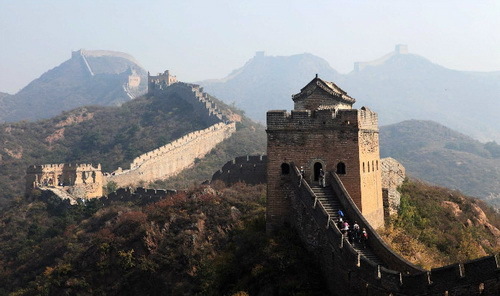 There are mainly three types of Great Wall watchtowers. The first type is built on the wall. It is the fastest to pass military messages. If enemies came, soldiers would be maneuvered in shortest time and got ready to quickly fight. The second type is the one located inside the wall and connects the passes or garrisons. In early times, some towers even directly linked to the capital, for the convenience of alerting the court. The third is built some distance away from the wall, to watch the enemies' movements. In peaceful days, the watchtower of Great Wall was the place where soldiers kept watch and animal dung and fire wood were saved. Soldiers raised sheep and cattle to eat and took their dung to burn, sometimes wolf dung was also used, and this is the reason why the beacon tower smoke is called "Langyan" (Wolves' smoke). While when war was coming, soldiers would light the fire wood to tell the next watch tower that dangers approached, so every watch tower would then get the message one after another until every soldier was fully alarmed and ready to fight.